Note: This ebook was provided by Dreamspinner Press in exchange for an honest review. 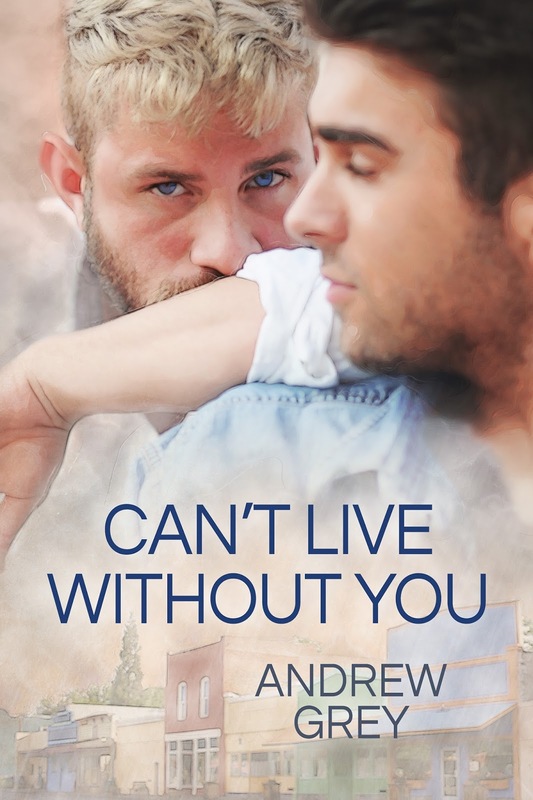 Can't Live Without You is the first book in author Andrew Grey's Forever Yours series from Dreamspinner Press and it's a second chance romance between two best friends who haven't heard from one another in seven years, a separation that was forced upon them by rejection and one dark secret. Justin Grove was nineteen the last time he was in his hometown of Biglerville, Pennsylvania. Upon his return, the rest of the world knows him as Justin Hawthorne, admired and respected Hollywood actor with an even more promising future than his already successful present. It's Justin's past, however, that he has no choice but to deal with now that he's back. His father threw him out because he was gay, and he left his best friend and first love George Miller without a word of goodbye. Even with seven years and a great deal of distance between them, the feelings they once had are still very much there. But how can anything come from their being together, what with Justin's career based in Los Angeles and George's mother and life in Biglerville? They lived without each other before, but can they do it again? Purchase Can't Live Without You on Dreamspinner Press | Amazon | B&N | iBooks | Kobo.